New CD Winter table runner project with detailed directions and photos. Join the blocks together using two simple steps on your sewing machine. Mix and match the 8 quilted in-the-hoop blocks to make endless table runner designs. Get clever and crafty with the original SVG artwork files using a digital cutter. 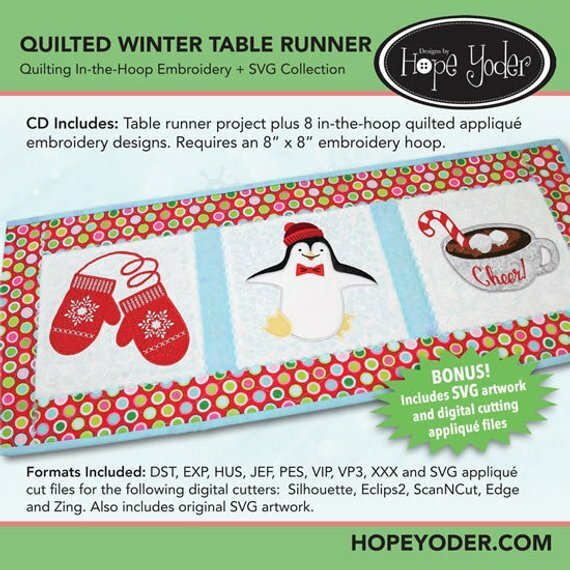 CD Includes: Table runner project, 8 in-the-hoop quilted applique embroidery designs. Requires an 8" x 8" embroidery hoop.